Have you ever noticed that relationships are SO important? Good relationships don’t just make life more peaceful and fulfilling, but they are really EVERYTHING in business too! I stay with the soccer club, when I like the coach; I pick a restaurant again and again, based on the kind server; I’ve even heard that if people leave a church due to differences, it is rarely due to doctrinal differences: it’s usually a relationship problem. Getting along with people has to be one of THE MOST IMPORTANT “skills” to develop. together, not separated by children, and yet no child required the parents’ attention, as the family of eight sat attentively with their notebooks and Bibles open. No coloring books, cars or Cheerios were needed. I sat in the back of the church; I could never have trusted my two children to behave well enough to sit near the front, and I was frustrated that the church nursery didn’t take children over age 2. I attempted listening to the sermon, but was stopped every couple of minutes by my 3 or 6-yr-old begging for more food, bathroom, crayons, whatever. I felt frumpy by my lack of time to smooth my hair in the humid Florida weather, and it felt frizzier by the minute as I watched “Barbie’s” beautiful blonde hair flow down her back that morning. I have had these feelings before: when I was pregnant, everyone else seemed to be losing weight. Smart people make me feel dumb. People with good kids make me feel like a bad parent. The prettier someone is, the uglier I feel. As Jerry Bridges says in Trusting God, the best way to tell if a line is crooked is to lay a straight line next to it. I was viewing this “Ken and Barbie” family as a straight line, and therefore I felt “crooked”. I believed I saw well-behaved kids, and therefore mine looked poorly behaved. I thought her hair was gorgeous, so mine must be ugly. I saw them as straight, so I saw my family as crooked. Sometimes, it’s not words that are said, but it’s the way someone acts. They will be warm and bubbly around friends, then stiff and uneasy around me. One family member avoided me altogether. You and I have heard the saying, “nobody is perfect” or “all have sinned” but we still hold people on pedestals of “near-perfection.” Dennis Rainey, in Building Your Mate’s Self-Esteem, says that we have “phantoms of perfection” – people whom we believe have all that and a bag of chips – and we try to compare ourselves to them only to end up falling short of the mirage. We judge others’ figures by how great they look in a business suit, but we judge our own body by how we look naked in the shower; or I recently heard, “We compare their highlights reel to our blooper reel;” then we conclude that they are perfect. AAAhh!! That’s it! I was holding this perfect church family on a pedestal (and so many others I have met) and others are holding me on the same pedestal of perfection!! So how are we supposed to get along with that?! Feeling crooked + improper reaction = lack of friendship. Feeling crooked + proper reaction = friendship!! Control our thoughts: A seed of jealousy will reap fruits of destruction of others and me. We have to replace the negative thoughts with positive ones QUICK!! When I try hard, I can recognize that “jealousy” is actually “admiration” in disguise, where the first God despises; the second is praising God for what HE has done through someone. I can give credit where credit is due (Romans 13:7), and tell the person what I admire. If I compliment the person on the very thing about which I am insecure, we are both uplifted. What is really so hard about: “Wow! Your children are really well behaved! You have trained them well.”? Similar to controlling thoughts, we have to recognize that people who are trying to be their best, are NOT some enemy. It is sinful to think negative about them for no reason other than their attempt at excellence. Jesus. There is truly only one straight line- as laid out in the Bible. He is the only Ruler (pun intended). When I try to aim in any direction but Him, I am walking on a thin line in sand. We can stay in peace with the fact that God Almighty made us who HE wants us to be. Trying to be anyone else is sin. Any time we have horizontal focus (other people) instead of vertical focus (God) we are in sin. It is fine to admire someone, and even try to improve ourselves, but not with a sinful, resentful or jealous heart. All we ever have to be is who He made us. I show my love for Him when I show my content with His creation. OK, so I could see where I did wrong thinking about the perfect family in church, and so I actually invited them over for lunch after church one Sunday. (and hopefully the Bowlins are reading this letter) I LOVED them!! I could hardly believe how easy it was to be with them. We actually had lunch together and were having so much fun, that they stayed right through till dinner. HOW DID THEY DO IT?!! Their kids were happy! I was able to tell them so and take notes on what books to read. Thank God for their example! 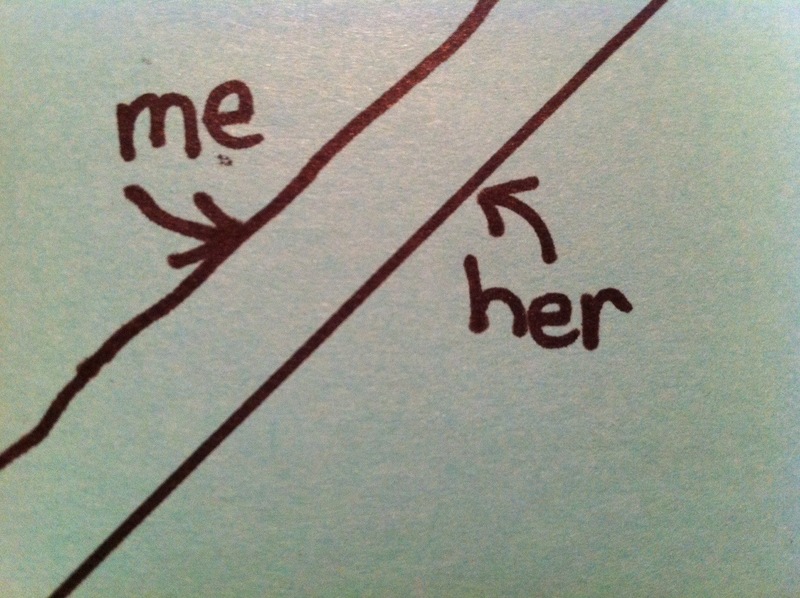 So honestly, what can I do about it if someone sees me as a straight line? It seems like if people have me on a pedestal, or have a low view of themselves, maybe it’s their problem? Yet this family did something right, when I was being wrong. We shut out people: We get tough, buffalo skin, so others can’t hurt us. Too bad so sad, people, just go away then. SO…How did that “perfect” family allow me to relax? It was as though they knew my insecurities and took care of me. Being seen as perfect + improper reaction = no friendship. Being seen as perfect + proper reaction = friendship!! I know many who would think this subject doesn’t matter for them, but they would be surprised at the number of people who hold them in high esteem. People are looking up to them right now – maybe as their leader, or parent or want-to-be friend. Anyone aiming for excellence in any area falls into this category. When I thought, “Judge you? I’m not even thinking of you!” that was a problem. We are called to LOVE others, and if I am not thinking of them, then I am not loving them. Time “trying to look perfect” is time thinking about myself, and not thinking of others. Some may feel like we are looking down on them, because maybe deep down, we are? Accept, approve and appreciate people. (Les Giblin, How to Have Confidence and Power in Dealing with People) The fact of whether I am looking down on them or not doesn’t matter as much as if they feel like I am looking down on them. We must uplift people before they have a chance to feel down. We can move mountains with a smile while looking people in the eyes, not with our noses raised! LOL! We should speak positively; we are being overheard. I remember a time when I overheard someone say how much they “couldn’t stand so-and-so’s handwriting” and therefore, I never wanted to write her a note, even though she hadn’t been talking about my handwriting. Her negative talk about someone else, made me uncomfortable. I heard a woman say, “I don’t believe in control top pantyhose, because if you need to control your top, you need to stop eating.” It always bothered me to eat with her. We have to stop our own self-praise (even accidental). People will see us as straighter than we actually are. I have sometimes said things in passing, that I didn’t think about as “self-praise,” but truly it was: “When I was working out at 5:30 this morning…” or “When my son was in his 5th hour of reading today…” or “It’s so hard having to get from Honors Chemistry to Honors Calculus class on time.” Hee! Or bragging under the guise of “God is doing wonders through me these days.” “Let me tell you how God is helping so many that I invited to church.” Proverbs 27:2, “Let another praise you.” And ask God to reveal your heart of times when you are praising yourself incidentally. Give ourselves a heart check-up: Where is my heart? Am I trying to get others to think highly of me or highly of themselves? Am I trying to look perfect, or tell others of my perfect Savior who saved a sinner like me? In this Fakebook world, we need to be real. Being real allows others to be real. There are enough “shiny plastic people” on earth. What we need is real people who really love other people. That’s what makes real friends. 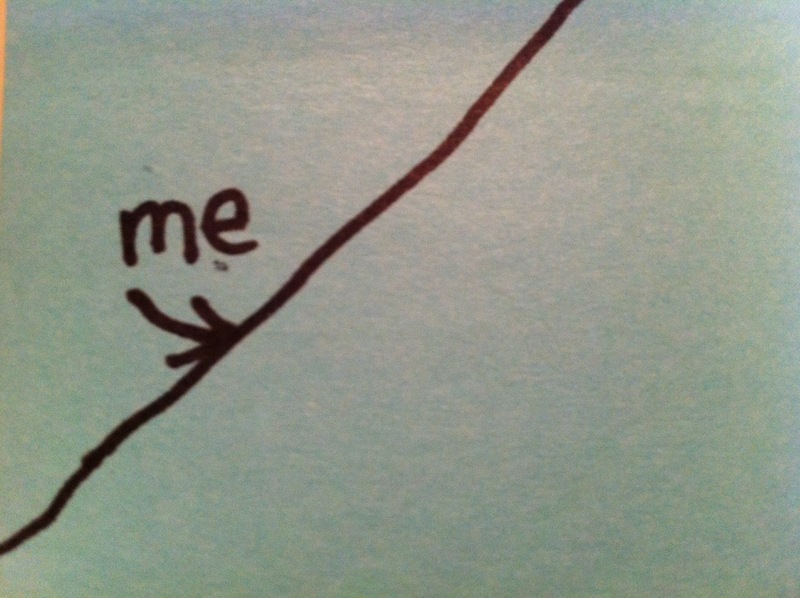 We can now recognize that people who see us as a straight line don’t usually tell us that. They (unless they read this 🙂 ) usually talk badly about us or to us. We have to love them anyway. Uplift them anyway. Be real anyway. It’s hard to do things for the glory of God, and be nice to mean people; it is easier for the “glory of me,” or to shut the door on the pain, but we can do it for God’s glory. Once my eyes were opened to this, I couldn’t knock off God’s children and say, “I’m not judging, I’m not even thinking of you.” Esteeming others as better than myself (Phil 2:3) is going beyond just trying to be my best, it’s treating others the best way we can. When we feel badly about ourselves, we have to think of the cause – is it possibly that we are holding something as a straight line that is not what God meant for comparison? When someone is attacking us, or not doing their best around us, is it possibly because they don’t feel good around us, because they hold us as their straight line? The magic of my husband, Chris, is that he holds himself to the highest discipline – always running and doing his best to hold himself to a straight line; yet, he makes everyone around him feel like a comrade, like they are coming with him and they are both capable and welcome. It’s what a leader does. Girlfriend, God created each of us with a specific purpose. We are insulting our Creator if we are tearing ourselves down. God created those around us with a specific purpose. May we keep ourselves from getting in their way, so they can be at their best around us. After all, that’s what friends are for. Thank you for sharing….some skin of the onion was peeled away as I read your letter. I then shared you with another who I know will appreciate your heart and love for Abba as much as I do..
Terri, Absolutely wonderful article! Very well put. This topic has always been tough for me. I am so thankful for my husband who I sometimes feel has the wisdom of Job, and his counsel on this. I have often struggled with people feeling somewhat uncomfortable with me mainly because of my personality or because they felt I was perfect in one area or another. In the past, I tended to “prove” I wasn’t and was left feeling fake in the process. Or I would go to the other extreme of “it’s their problem and insecurities, not mine”. Neither being a Christlike view of the issue. This article, Team system, Raymond and most of all a proper view of who I am in Christ was/is the simple answer. Thanks for writing so we all can be better and have an article like this that we can share. Blessing to you!! Wow, this really explains some things! I can totally relate to a lot of this. Now I understand more fully my own personality/quirks and how that relates to others. This also compels me to examine how much I really love/serve others before self. This is a good blog to marinate in! Thanks for allowing God to use you once again! God Bless! Thank you for being so real and sharing your thoughts. This writing was so good, as I was reading it,I was clearing wrong thinking picked up along the way of the trail of life’s path. Teri, your line sure is straight on the mark God chose for us to be on!! You make all who are lucky to know you feel like our line is straight!! What a leader you are! Thank you for your pearls of wisdom!!!!!! What a great lesson for me. I pray the Lord will make clear to me these areas in my life so I can ‘stop’ and redirect my thinking from self to those around me. Thank you for giving your time to encourage all of us. Right on target! Thank you! Loving your blogs! Thanks for this post, I really love this principle. As soon as you started describing the family I thought ‘that must be the Bowlins.’ I’ll be sure to pass this on to them. I give thanks to God the Father for your words today. I needed to hear them. Terri, thanks for the great reminders and for always modeling these principles to the best of your ability. I love reading your articles and seeing God shine through you here on earth. Love you. i really needed to be reminded of internal judging today. Thank you!